Busan, South Korea, is one of Asia’s most underrated cities. 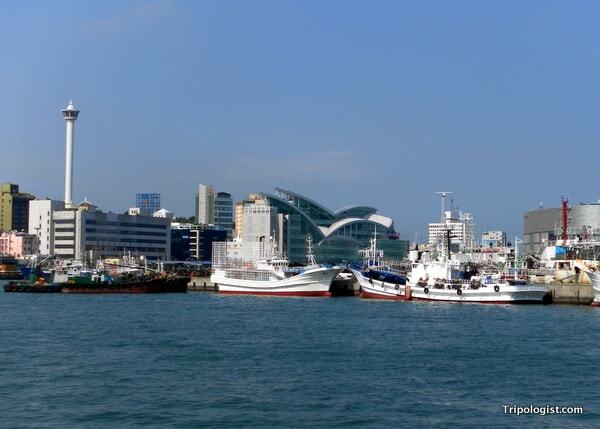 The second largest city in South Korea, Busan is more known for its large port than its attractions. However, if you visit the city, you’ll uncover a laid back destination that has lots to offer visitors. From beaches to beautiful temples, Busan is a fantastic city for travelers. So, whether you’re entering South Korea from Japan or taking the dozens of buses, trains, and planes each day from Seoul, Busan is sure to offer something that will interest you. The entrance to Jagalchi Fish Market in downtown Busan. 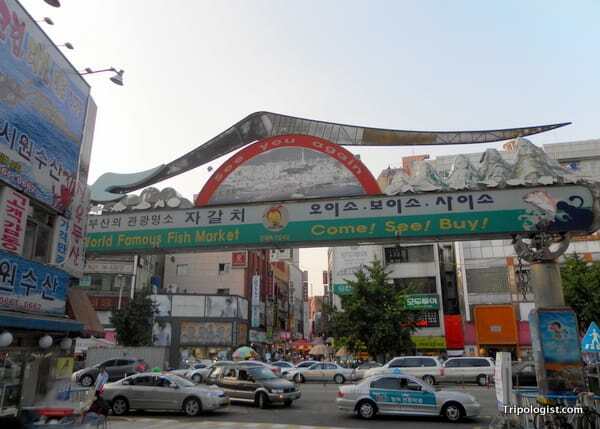 Jagalchi Fish Market is the largest in South Korea, and if you’ve never been to an Asian fish market, it’s a must see. Stall after stall line the inside of the market selling an amazing variety of seafood. 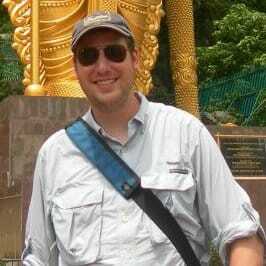 Many of the offerings are familiar to the average westerner, but some will certainly amaze. If you’re feeling adventurous, sample some of the seafood raw, directly from the seller. If that’s a bit too exotic, the fish market is surrounded by many amazing seafood restaurants. Seokbulsa might be difficult to find, but it’s certainly amazing to behold. Sitting high up in the mountains above Busan, Seokbulsa has many of the elements found in a normal Korean Buddhist temple. However, behind the buildings is one of Asia’s most amazing sights: a narrow crevice in the rocks decorated with carvings that are quite remarkable. If you want more information, see my full article on Seokbulsa Temple. Haeundae Beach is one of the top beaches in South Korea, but always crowded in the summer. 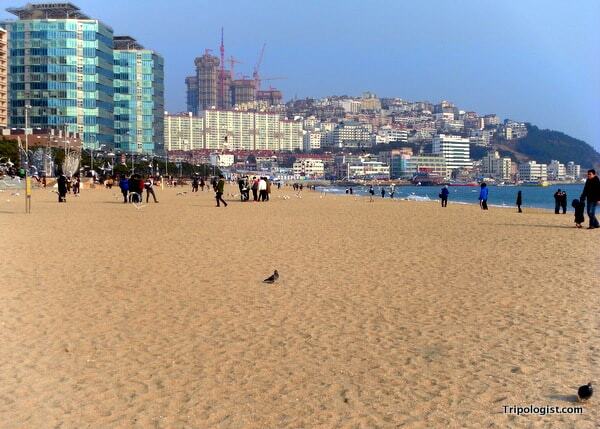 Haeundae Beach is one of the most popular beaches in all of South Korea. In fact, visit in the summertime, and people might outnumber the grains of sand on the beach. However, if you can deal with the crowds, Haeundae is quite a beautiful place. Even better, the area around the beach has been built up to include a large variety of restaurants and attractions, including the Busan Aquarium. If you’re looking for a more quiet beach atmosphere, check out Songdo Beach or Gwangalli Beach which are significantly less crowded. 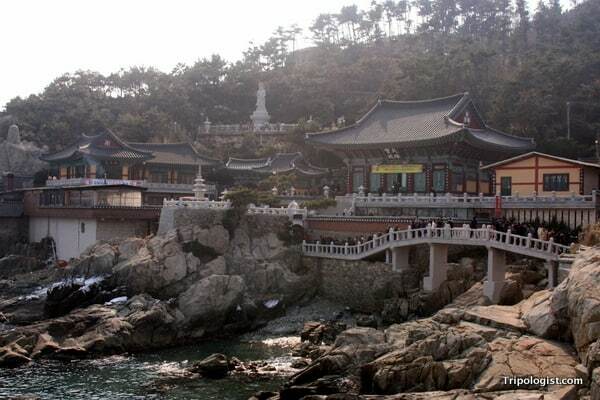 The beautiful, oceanside Haedong Yonggung Temple outside Busan. Perched on a cliff overlooking the East Sea, Haedong Yonggung is one of the most unique temples in all of South Korea. While the temple was originally constructed in the 14th century, most structures date from the latter half of the 20th century. 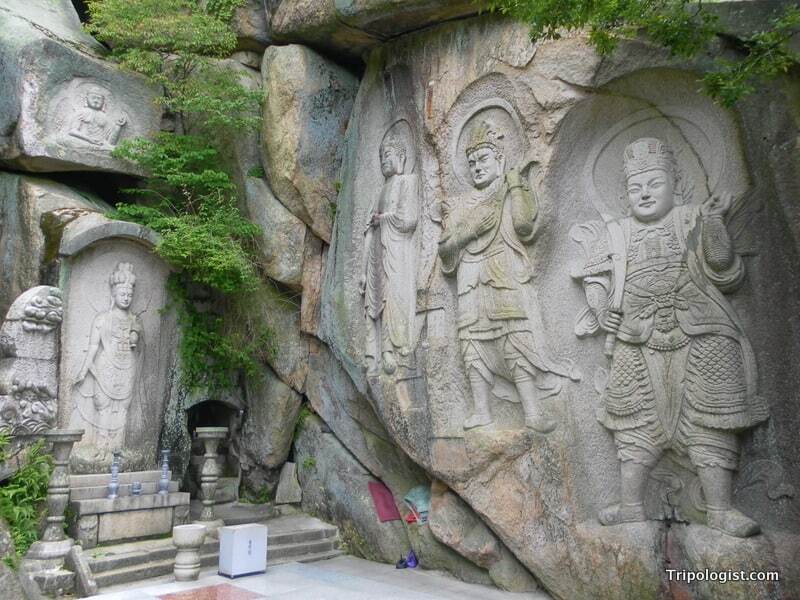 As one of the few Korean Buddhist temples not located in the mountains, Haedong Yonggung is a popular location for many of the festivals in the Buddhist calendar, but is especially popular on New Year’s Day. At first, it might seem a bit weird to put a chain department store on the list of Busan’s best attractions. However, this is no ordinary department store. In fact the Shinsegae in Centrum City, near Haeundae Beach, is the largest department store in the world. In addition to the standard department store offerings, this Shinsegae location offers a two-story spa, an ice rink, a movie theater, a golf driving range, and much more. It’s certainly a one-stop shop for all your needs. Find somewhere great to stay in Busan, South Korea! What are your favorite things to do in Busan, South Korea? Let us know in the comments section below. Thanks for the recommendations Jim. I suspect the temple would be the first place on that list I’d want to see. Those places always fascinate me and it looks very interesting. I’d probably then head to the beach but maybe outside of busy season. Yeah, the temple is amazing. Definitely worth visiting if you make it to Busan. Thanks for the comment. Think I will take a pass on the shopping centre, but the Fish Market and the Temples very much appeal.